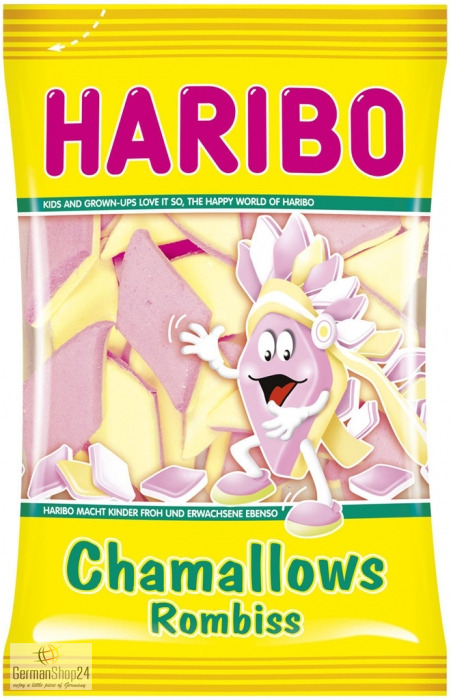 Pink-yellow marshmallow candy pieces in rhombic shape and in the flavor vanilla. 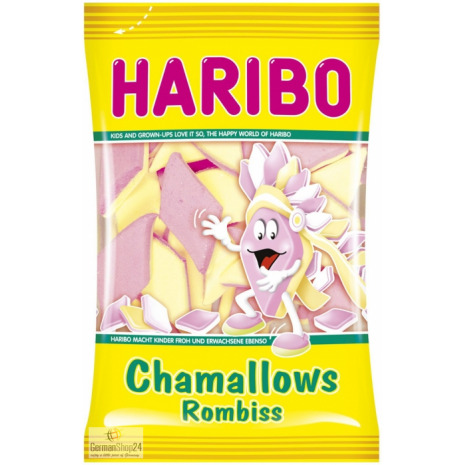 Haribo Chamallows Rombiss – these product pieces having a distinctive appearance. The bite-sized marshmallow candies in rhombic shape are so delicious and soft and come in the flavor vanilla. Made in Belgium. 225g / 7.94 oz NET. WT. Glucose syrup, sugar, dextrose, water, stabilizer: sorbitol, gelatin, flavoring, colors: cochineal extract, curcumin. Glukosesirup, Zucker, Dextrose, Wasser, Stabilisator: Sorbit, Gelatine, Aroma, Farbstoffe: Echtes Karmin, Kurkumin.